I want to download ArcMap shapefiles to a Garmin Oregon 400t, simple polygons w/IDs, lines, and points. Ideally, one or two attribute columns like vegetation type or survey number would be included. I’d then take the Oregon out and re-trace the shapefile perimeters and look for changes in the vegetation. Maybe “draw” a few more polygons using tracks and waypoints, then save and download the change data into your software, and export it as shapefiles, depending on the type of feature it is. 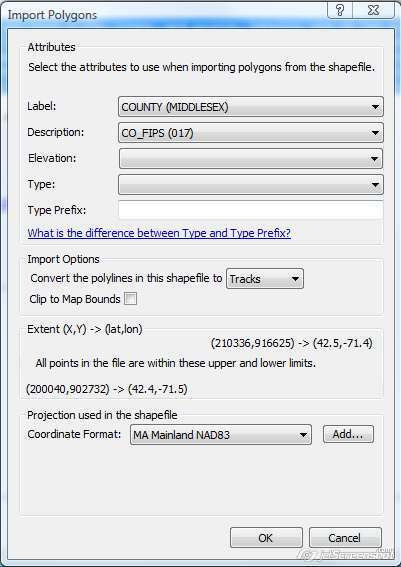 So, import from ArcMap (or generic shapefile), download to Garmin as a layer, make waypoint “edits” then transfer back to ArcMap as shapefile. Will your software do these things? Yes, you can do all this using ExpertGPS Pro. There are a few “gotchas”. The Oregon can hold 10,000 trackpoints, and 20 saved tracklogs. That means you’ll be limited to 20 polygons from the shapefile, unless you use ExpertGPS to join some of them together. You can map one of the attribute columns to the track name, and a second to the description/notes field on the track. Once you get the data the way you want it on the GPS receiver, ExpertGPS Pro will allow you to import updates from your field survey and add the modified polygons back to your master database in ArcMap.